The last few years have seen a large increase in coffee shops from Australia and New Zealand. Now it seems like every Londoner has a favourite place to grab a ‘Flat White’. However, a new coffee shop in the centre of Piccadilly shows that our Antipodean cousins are not the only ones who can do an excellent cup of coffee. Kahve Dunyasi is a popular coffee chain in Turkey. Their shop in central London is their first British branch and for many Londoners, it will be their first taste of how coffee is made in Turkey (be warned – Turkish coffees pack a terrific caffeine jolt!). For the best coffee experience, I would recommend getting table service (with free chocolate as an accompaniment). Along with strong Turkish coffee, the selection of sweets puts other coffee chains to shame. 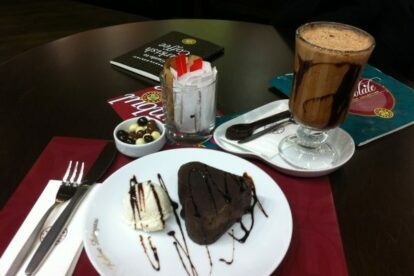 The chocolate brownie is served warm with a melting, gooey, chocolaty centre – perfect with a warm drink. Weekends can get very busy with both hungry shoppers and Turkish expats, so try to stop by during the week. Be warned – having any of these powerful coffees in the evening may keep you up all night!